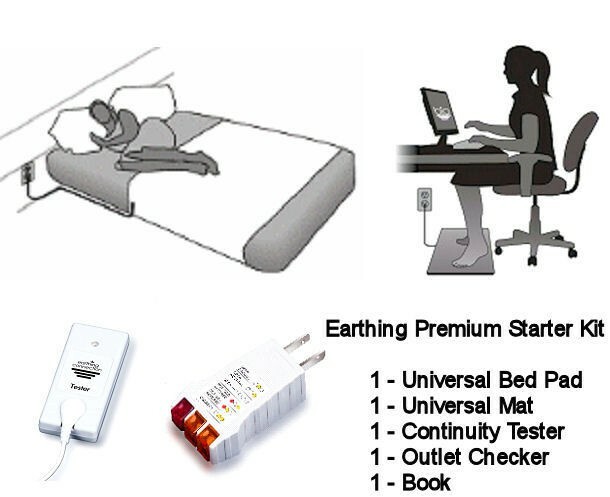 For those asking us to recommend the most effective and affordable Earthing product to begin we offer the following: 1 Earthing Universal Bed Pad with conductive silver fibers. Place the Earthing Universal Bed Pad at the foot end of the bed. The bed pad measures 120 X 36 inches. 1 Earthing Universal Mat made from pure conductive carbon rubber. Also comes with a continuity tester, outlet checker and an Earthing Book. The mat can be used on the floor to place your bare feet or on a desk to place your wrists and forearms. Also comes with a continuity tester, outlet checker and an Earthing Book.